Aroldis Chapman is arguably the game's top closer. 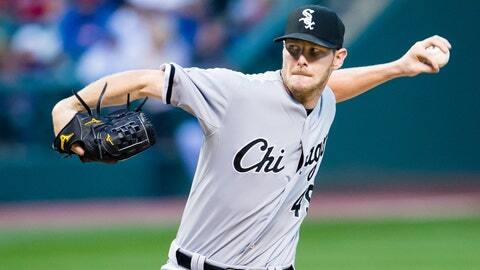 *If I were White Sox general manager Rick Hahn, I would take the exact approach that Yankees GM Brian Cashman did with Chapman when negotiating deals for left-hander Chris Sale. In the American League alone, Hahn could tell the Rangers, Astros and Red Sox, "You want the one starting pitcher who could help you win the World Series? He won’t come cheaply." He could deliver the same message to the Dodgers in the NL, knowing that they missed out on Cole Hamels last July and are just plain missing Clayton Kershaw this year. The White Sox could effectively name their price for Sale, who is under club control at below-market rates through 2019 and a more attractive trade candidate than Chapman, a potential free agent. Hahn’s reported five-player request is not unreasonable — the Yankees got four players for Chapman, including the Cubs’ No. 1 prospect, shortstop Gleyber Torres, and an experienced major-league pitcher, right-hander Adam Warren. For Sale, the White Sox could ask for Rangers right fielder Nomar Mazara, for Astros third baseman Alex Bregman, for Dodgers lefty Julio Urias, for Red Sox second baseman Yoan Moncada and/or left fielder Andrew Benintendi. And they would not at all be out of bounds. If no team wants to meet the White Sox’s price, fine — the Sox could involve an even greater number of suitors in the off-season, and perhaps make an even better deal. Or hold Sale again. Like Cashman before him, Hahn holds the best toy. But unlike Cashman, he is not facing the loss of a prized asset for only a draft pick. He can wait and wait and wait. *The Nationals declared five untouchables in the Chapman talks (Joe Ross, Lucas Giolito, Trea Turner, Reynaldo Lopez, Victor Robles). The Indians seemingly were unwilling to part with either of their two top outfield prospects, Bradley Zimmer or Clint Frazier. Yes, Chapman is a rental, but now the Nats’ top two left-handed hitters, Bryce Harper and Daniel Murphy, might end up facing Mr. 105 mph in the post-season. The Indians, meanwhile, could miss out on a rare opportunity, during a season in which many recent AL powers are down. Those clubs were not in as advantageous a position as the Cubs, whose abundance of young position players enabled them to do something big. But give Cubs president of baseball operations Theo Epstein and general manager Jed Hoyer credit for seizing the moment, even though their farm system is probably weaker than both the Nationals’ and Indians’ overall. One rival executive identified only three elite prospects in the Cubs’ system — Torres, outfielder Eloy Jimenez and second baseman/outfielder Ian Happ. Yet, as young as the Cubs are at the major-league level, their competitive window is somewhat narrow, with right-handers Jake Arrieta and John Lackey eligible for free agency after next season. The time to strike was now, and the Cubs knew it. 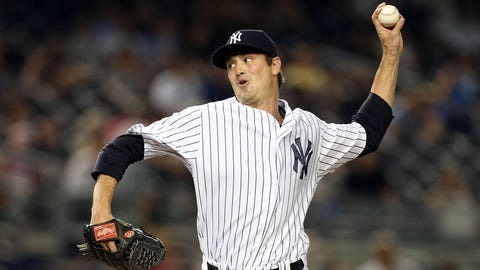 *Considering the return that the Yankees received for Chapman as a rental, it’s natural to assume that the "asks" for Royals closer Wade Davis and Yankees lefty Andrew Miller will be even higher. Davis, after all, is under club control through next season, Miller through 2018, both at club-friendly salaries. But here’s the problem: The Chapman trade, like the Shelby Miller trade, was an outlier. The danger now is that the Yankees’ return for the Chapman deal will have the same chilling effect on the relief market that the Braves’ return for Miller did on the starting-pitching market. Teams started thinking, "If the Braves could get Dansby Swanson, Aaron Blair and Ender Inciarte for Miller, imagine what I could get for Pitcher X." Prices shot up, and the market stalled. The same thing could happen with Davis and Miller. The return for Chapman might have set too high a bar. *The Chapman deal did not become official until after Epstein, Hoyer and Cubs owner Tom Ricketts spoke on the phone with the reliever about his domestic-violence allegation and were satisfied with the response. The Cubs received permission from Major League Baseball to talk with Chapman early Monday morning, sources said. The call took place at 1 p.m. ET, about one hour after some reported the deal was done. While it’s unlikely the Cubs would have backed off over anything Chapman might have said — and unlikely that Chapman would have said the wrong thing — the team had the right to walk away based upon the outcome of the call, sources said. The conversation was the final condition of the deal. *Chapman is arguably the game’s top closer, but for years many in the industry have wondered if he could be used more often in multi-inning stints, or even in specific high-leverage matchups before the ninth inning. The Dodgers, before pulling out of a deal for Chapman last off-season, planned to deploy him creatively, with Kenley Jansen remaining their closer. 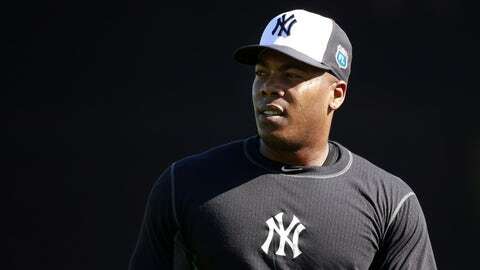 The Yankees, on the other hand, immediately made Chapman their closer when he returned from his 30-game domestic-violence suspension. 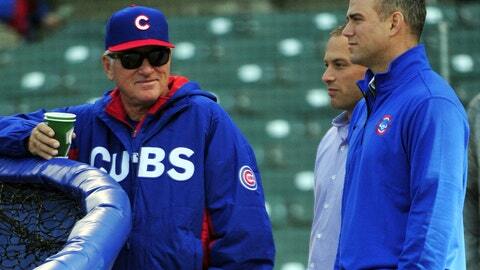 The Cubs surely will use Chapman in the ninth as well, at least in the regular season. But if manager Joe Maddon needs Chapman to counter the Nationals’ Murphy and Harper in the eighth inning of a postseason game, he surely will use his weapon accordingly. As one Cubs person put it, "In the postseason especially, all bets are off." *Warren did not pitch as well for the Cubs as he did for the Yankees, but he served as something of a utility man for the team’s rotation, making one start so that Maddon could give his other starters extra rest. Without Warren, the Cubs will be more vulnerable if one or more of their starters deals with injury or fatigue. Right-hander Trevor Cahill or lefty Brian Matusz likely would get the first call; both are stretched out at Triple A. Righty Jordan Pries, acquired from the Mariners in the Mike Montgomery trade, represents another option; he pitched well for Iowa on Monday night. In theory, left-handed relievers Montgomery and Travis Wood also could start, but neither is stretched out.